Fifty mile an hour winds combined with fairly heavy snow and rapidly dropping temperatures made my journey to work today distinctly hairy. As I drove along the north shore of Lake Ontario I could hardly see at all, with all the snow blowing off the lake and over the road. The weather warnings issued by Environment Canada advised that "motorists and the public in general should exercise much extreme caution". I was completely shattered from all that exercising by the time I got home. Oh, and we've lost another twelve or so shingles from the roof, too, so it was not a good day at the homestead either. A fascia board has gone (and we can't see it anywhere) and some soffits have come off as well, this time. The snow inconveniently melted off the roof yesterday, exposing it just in time for the winds to wreak their worst today. The roofers will come back at the weekend, but as it is due to snow again on Friday, I'm not sure how much they'll be able to do. The roofing guy thinks that the roof needs a period of hot weather to weld the shingles onto each other (there's a layer of glue on the underside of each shingle) and make it more solid (the top half is nailed to the roof). Such weather seems like a long way off at the moment and we don't want too many more days like today where we watch helplessly as chunks of roof fly past the windows. Perhaps we should have waited and got the roof replaced in the spring. 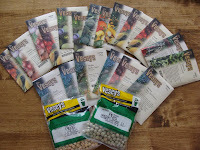 Looking on the positive side, my first order of seeds arrived yesterday, bringing with them at least the promise of better weather in the months to come.